For the city, see Shasta Lake, California. Shasta Lake, also popularly known as Lake Shasta, is a reservoir in Shasta County, California, United States. It began to store water in 1944 due to the impounding of the Sacramento River by Shasta Dam, the ninth tallest dam in the United States. Shasta Lake is a key facility of the Central Valley Project and provides flood control for the Sacramento Valley downstream of the dam. Water outflow generates power through the Shasta Powerplant and is subsequently used for irrigation and municipal purposes. The reservoir lies within the Whiskeytown–Shasta–Trinity National Recreation Area, operated by the Shasta-Trinity National Forest. The California Office of Environmental Health Hazard Assessment (OEHHA) has developed a safe eating advisory for fish caught in the lake based on levels of mercury or PCBs found in local species. With a capacity of 4,552,000 acre⋅ft (5.615 km3) at full pool, the lake has an elevation of 1,067 ft (325 m), and a surface area of 30,000 acres (12,000 ha), making it the state's largest reservoir, and its third-largest body of water after Lake Tahoe and the Salton Sea. Ten miles (16 km) north of the city of Redding, with the town of Lakehead on its northern shore, Shasta Lake is popular for boating, water skiing, camping, house boating and fishing. Formed by the damming of the Sacramento River, the lake has 365 mi (587 km) of mostly steep mountainous shoreline covered with tall evergreen trees and manzanita. The maximum depth is 517 feet (158 m). The lake has four major arms, each created by an approaching river: the Sacramento River, the McCloud River, Squaw Creek, and the Pit River. The Sacramento River's source is the Klamath Mountains. The McCloud River's source is Mt. Shasta. The Pit River flows from Alturas, and the waterfall Potem Falls is located on that arm of the lake. Shasta Lake hosted the first "Boardstock" event in 1996, which continued there annually through 1999, after which the annual event moved to Clear Lake, California, 170 miles southwest of Shasta Lake. Boardstock drew many pro wakeboard riders from around the world, with an average attendance of 15,000 people. The event lasted for 3 days each year with several wakeboard contests being performed. There are a number of marinas on Shasta Lake offering a variety of services, including houseboat rentals. Bridge Bay Marina is the largest marina on Shasta lake with over 700 slips. It has a restaurant, bar, and lodging, as well as retail and other facilities. Visitors to Bridge Bay may rent one of 100 houseboats, as well as ski boats, fishing boats, patio boats, and personal water craft such as stand up paddle boards, jet skis, and Jetovators. Bridge Bay boasts a busy public dock during the summer season, with a gas dock, food, ice and retail amenities. Digger Bay Marina has over 150 boat slips in the marina, as well as a retail store and small boat rental. Digger Bay is located almost 10 miles from Highway 5. Shasta Marina Resort is located at the center of the Sacramento Arm of Shasta Lake in the O'Brien Inlet of Lakehead, CA. Packer's Bay Marina is located at the center of the lake, just north of Bridge Bay Marina. Antler's Marina is Shasta's northernmost marina. Silverthorn Marina is located on the east part of the lake and offers large houseboats for rent. Jones Valley Resort is the easternmost marina on the lake. Jones Valley is tucked far into a cove and features six different model rental houseboats, including the largest on the lake, the Titan. Holiday Harbor is located up the McCloud River Arm, east of I-5. Sugarloaf Marina is located up the Sacramento River Arm and offers a marina store, overnight slips, and fuel. Shasta Lake has a temperate climate. Shasta Unit — of the Whiskeytown–Shasta–Trinity National Recreation Area. 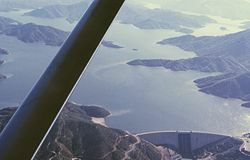 ^ "California: Shasta Dam (U.S. National Park Service)". www.nps.gov. Retrieved 2018-12-27. ^ "USSD Dam, Hydropower and Reservoir Statistics". United States Society on Dams. Archived from the original on 2014-12-29. Retrieved 2014-11-29. ^ "Bureau of Reclamation". www.usbr.gov. Retrieved 2018-12-27. ^ Pham, Huyen Tran (2017-01-24). "Shasta Lake". OEHHA. Retrieved 2018-06-13. Department of Water Resources (2009). "Station Meta Data: Shasta Dam (SHA)". California Data Exchange Center. State of California. Retrieved 2009-04-01. "Shasta Lake Facts, Statistics and Data". ShastaLake.com. 22 September 2009. Retrieved 2009-09-17. Wikimedia Commons has media related to Shasta Lake.